Xavier's graduate nursing program is for nurses who not only want to serve—they want to lead. Graduates are prepared as holistic healers and leaders in the delivery of health care with an educational foundation grounded in Jesuit ethics and value. Be the best provider of nursing care today and a health care leader forever. See Entry Points for your point of entry to graduate nursing as determined by your previous academic preparation and your length of experience as a registered nurse. FNP applicants: See below for additional application and admission information specific to this track. NOTE: Current MSN students wishing to change their track do not complete the online application. Contact Marilyn Gomez further information. Three professional recommendations (provide contact information for recommenders in online application. Electronic form will be sent to them via email). NOTE TO FNP applicants: One recommendation must be from a current supervisor. The other two must be from health care professionals prepared at the master's or doctorate level. Additional instructions and documents will be provided at time of application. International applicants must submit additional documents for admission as required by the University. Contact the Office of the Graduate School for further information. Although there is no admission test for registered nurses applying to a graduate nursing program, dual degree programs require official scores from an admission test (see next 2 bullets). Admission is available for the fall semester of each academic year. Due to high interest in the program and limited clinical sites, the priority deadline for application to the MSN FNP program is February 15. Admission is competitive. Applicants will be reviewed and notified of their status by March 1. Applications received after the deadline will be reviewed based upon space availability for the fall semester. Post Masters FNP application deadline is November 1 and will be reviewed on a case by case basis. The MSN curriculum for registered nurses consists of a minimum of 36 semester credit hours. Associate degree or diploma-prepared registered nurses without a bachelor's degree complete bridge courses (RN to MSN) prior to matriculation into the MSN program. Registered nurses with a BA/BS (Educational Mobility Option) demonstrate eligibility for the MSN program through the admission process (see admission instructions). The core MSN courses include theoretical and practical knowledge, which serve as the foundation for advanced nursing education in a variety of roles. Core courses focus on three major themes which are consistent with the philosophy for the graduate program: critical systematic inquiry, professional and personal development, and management of information and resources in a rapidly changing health care environment. The MSN MIDAS pre-licensure curriculum consists of the Nursing Core (except for NURS 690) and courses designed specifically for MIDAS students. NURS 501: - Health Care Ethcs-Nurse Leaders - 3 Credit Hours: This course examines ethical frameworks, such as theories of justice, rights-based ethics and virtue ethics and their significance to the delivery of health care. Analysis of ethical dilemmas focuses on differentiating what are called traditional and modern ethical frameworks for decision-making. Application will be made within the parameters of nursing\2019s metaparadigm (person, nursing, caring, healing, health, environment) using personal and professional processes of valuing, unconditional acceptance and deciding in the preservation of wholeness and dignity. NURS 854: - Advanced Informatics-3 Credit Hours: The focus is to improve clinical and administrative decision making through an in-depth understanding of healthcare informatics. Emphasis is on technology based health applications which support clinical, administrative, research, and educational decision making enhancing the efficacy of nursing endeavors. Current trends and issues in using, designing, and managing heath care information systems will be examined. NURS 690: - Healthcare Policy-Nurse Leader - 2 Credit Hours: This course provides an overview of processes and issues in health care formulation in the private sector, and at local, state, and federal levels. Consideration will be given to selected issues in nursing and health care as they influence health policy within socio-cultural, economic, political, ethical, and historical context. Attention is given to the role of advance practice nurses in policy decisions in the public and private sectors with the intentionality of improving health care delivery. NURS 754: - Leadership/Management Concepts-3 Credit Hours: This course focuses on leadership and management concepts that are essential for holistic nurse leaders at various levels throughout the healthcare organization. The focus is to prepare holistic nurse leaders for collaborative practice in complex healthcare organizations through examination and application of effective leader behaviors. 2018 Among the best master's programs in the US by US News & World Report for 2018. Among the best master's programs in the US by US News & World Report for 2018. The Master of Science in Nursing program is open to nurses with bachelor's or associate degrees or diplomas at an entry point customized to your particular level of preparation. RN with BSN, RN with BA/BS (Educational Mobility Option), or RN with ADN/Nursing Diploma (RN to MSN). Even if you are not a Registered Nurse and don't have a nursing degree, you can earn your Masters' in Nursing, no matter what kind of bachelor's degree you have. The MSN: Direct Entry as Second Degree—MIDAS Program is a 20-month full-time pre-licensure MSN program offered on site. Xavier University has received $1,387,156.00 from HRSA to prepare Family Nurse Practitioners living in rural Ohio through their Master of Science in Nursing degree program. Included in the grant are traineeships for nurses living in the following areas: Lima, St. Mary's, Marietta, and Urbana, Ohio, or work in a FQHC in the Cincinnati area. All courses are taught through synchronized video-conferencing from Xavier University supporting real-time faculty-time while students attend classes at local hospital partners located in those areas. Traineeship funds cover full tuition, books and fees, and provide $11,730.00 per year for two years. Please contact Dr. Susan M. Schmidt or call 513-745-3814. Learn more about the FNP program. Xavier nursing graduates practice nursing throughout the Greater Cincinnati region and across the country. Our graduates are well-respected in the health care community as knowledgeable, professional and ethical and prepared to excel in meeting current and future challenges in health care delivery. 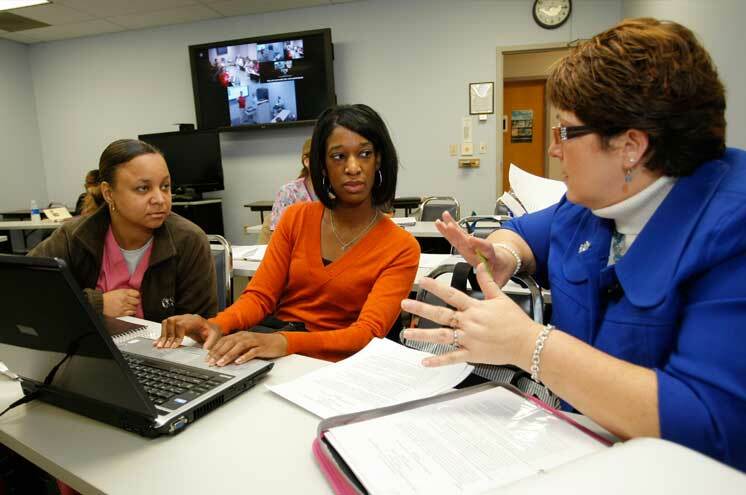 Faculty members are outstanding practitioners with years of experience in nursing and education. Their doctoral areas of study include nursing, epidemiology, natural health and psychology. Several also hold specialized certificates in community health, gerontology and occupational health as well as certificates of authority in the state of Ohio. Xavier's new, state-of-the-art clinical simulation laboratory provides a futuristic simulated learning environment. Using a human patient simulator, students have the opportunity to participate in challenging, real-life scenarios. Xavier's life-sized, computer-driven human simulation mannequin blinks, speaks and breathes, while also mirroring accurate human reactions to procedures such as CPR, ventilation, catheterization and intubation. Renea Ball had confronted the challenges of rural health care in emergency room and area schools, but the school experience was, in some ways, more gut-wrenching. Like the third-grade boy who was labeled learning-disabled. As the school nurse, she discovered the real problem was medical - he had such serious ear problems that he was functionally deaf. When she was studying for her Master of Science, Angela Fraiz focused her research project on an area of nursing that intrigued her - the Bone Marrow Transplant Unit at Cincinnati Children's Hospital Medical Center. Cindi Bedinghaus holds an MSN from Xavier. Now she is the Assistant Vice President of Patient Services for Cincinnati Children's Hospital Medical Center. First, the prognosis: the demand for skilled, well-trained nurses is expected to increase at a nearly 20% level through 2022. Plus nurses continue to be the largest single component of hospital staff as the primary providers of patient care. But beyond the numbers, our unique Jesuit philosophy of caring for the whole person not only develops your intellect but also your sense of empathy—a quality that goes beyond a resumé. Currently the MSN for RNs is offered on-site at the main campus and via video conferencing at partner sites throughout Ohio and, for VA employees, Lexington, Kentucky. MSN: Direct Entry as Second Degree - MIDAS Program - This is a 20-month full-time pre-licensure MSN program offered onsite at the main campus. Accelerated BSN - Connect with your true calling in as little as 16 months. Graduates are prepared to be leaders in addressing the complexity of 21st-century health care and health care outcomes.